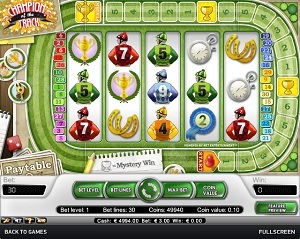 Champion of the Track is an online video slot machine game from Net Entertainment that has been released in January 2009. This online video slot game has 5 reels and 30 pay lines. The theme of Champion of the Track is inspired by horseracing. At first glance, you will see that the outside of the reels is surrounded by a board game-like design, which actually has a higher purpose in this online slot machine game. This game is totally delightful to play at because it can reward you with lots of free spins, and you can easily trigger it by just getting 3 Race Horse scatter symbols. The free spins you get can help you advance in the Career Steps bonus game, and when you do complete a race, you even get to re-trigger another set of free spins! There are also Mystery wins that you can receive along the multi-step bonus game, so choose your jockey/horse and let the race begin! When it comes to their online slots games, Net Entertainment loves to get attention, and they do so by letting every interested online slot player to have the chance to play instantly without having to download anything at all! If you love horseracing and if you also happen to like playing the Snakes and Ladders board game when you were a kid, then you will surely love playing the Champion of the Track online slot game! It has Wild substitutes, free spins, a maximum payout of 10,000 credits per line bet (in the regular Champion of the Track slot game), a high payout ratio of 96.5%, an intricately designed horse racing bonus game and jockey Career Steps with a maximum win of up to €48,532! Net Entertainment always strives to bring great quality graphics and lively sounds to their avid online slots players. Champion of the Track is a must-love slot game that is created especially for those who love horses and the thrill of the win in horseracing. The background setting is absolutely similar to that of a real racehorse track. The symbols are drawn just like what you will see in classic pastel-colored cartoons. The colors are perfectly balanced, and due to the overall theme color being green, you will not strain your eyes when you play this game for hours. The overall graphic design of Champion of the Track primarily showcases the color green, with other colors such as red, purple, blue, brown, and yellow. The constant background music when you are playing Champion of the Track slot game is the usual crowd chatter that you normally hear in live horse racing events. A short, celebratory, trumpet-like music and the snorting of a horse will fill your ears whenever you manage to hit the Wild symbol (Jockey). There are no card deck symbols available in the Champion of the Track online video slot game. The regular symbols you will find in Champion of the Track are: the 2nd Place Ribbon, Horseshoes, Stop Watch, Binoculars, blue Jockey #9, red Jockey #7, green Jockey #5, and orange/yellow Jockey #4. The Wild Symbol is the Jockey. The Jockey acts as a substitute for all other symbols (except the Scatter symbol) in order to help you complete a winning combination. • The Race Horse scatter symbol can be scattered anywhere on the 5 reels to complete winning combinations, provided that 2 or more Race Horse scatter symbols appear. Your winnings are calculated by multiplying the Race Horse symbol combination payout (see Regular Payout Schedule) by the total number of coins you’ve bet. If you hit 3 or more Race Horse scatter symbols that are anywhere on the 5 reels, you will trigger the Free Spin Bonus game. • The Champion’s Trophy scatter symbol, in order to win, it must appear left to right (reels 1-5) in consecutive order and on an active bet line. The Champion’s Trophy symbol does not give you any winnings; however, they allow you to enter the Day at the Races Bonus Feature game. If in case you get a regular win and a scatter win, you are paid for both of them, because the Race Horse scatter symbol doesn’t have to appear on an enabled pay line for you to win. Scatter rewards are independent from pay line rewards, and so, they are added to the pay line win. Champion of the Track has 3 very interesting Bonus Feature games to watch out for! Free Spins Training Track Bonus Feature Game – You must get at least 3 Race Horse scatter symbols anywhere on your screen in order to win 10 Free Spins and activate the Free Spins Training Track Bonus Feature game. In this game, you have the chance to double (multiplier x2) everything you will win (except for other Bonus Feature games, and steps in your career as a jockey). You can win up to 4 career steps. Take your horse down to the training track and prepare for victory. For each Race Horse scatter symbol you get, you will pass 1 horse on the track. Pass 5 horses to win 1 career step and qualify for the next training session. When you do pass 5 horses and completed a career step, the Free Spins will reset back to 10 and the Scatter counter back to 0. All unused Free Spins are then converted to a coin value. In the 4th session, the coin value of unused Free Spins is doubled (multiplier x2)! When the Free Spins bonus game is over, you are then returned back to the regular Champion of the Track video slot game and your bonus game wins are added to your win total. Day at the Races Bonus Feature Game – You must get 3 or more Champion’s Trophy scatter symbols in consecutive order from reels left to right (and on an active pay line) in order to activate the Day at the Races Bonus Feature game. The purpose of this bonus game is to choose a Jockey to ride your Race Horse, and watch your horse race against 3 other horses. The better the performance of your horse in the race, the more you win! Possible winnings in the Day at the Races Bonus Feature game are: a random number of coins for the Jockey you choose; up to a 5x Multiplier on the Jockey coin win; up to 4 Career Steps; and the total coin win is the Jockey coin bonus that is multiplied by the race win multiplier. Take note that only 1 Bonus Feature game is rewarded per spin. Career Bonus Feature Game – The Career Track is found surrounding the outer part of the Champion of the Track slot game reels. You are awarded Career Steps during the Free Spins bonus feature game, and the Day at the Races bonus feature game. For each Career Step you win; you will advance 1 step along the Career Track. When you land on a Golden Cup, you are awarded Mystery coins. When you land on the Champion’s Trophy, you are awarded the Career Bonus. The more you bet, the more you win, it’s as simple as that! You can win up to 97,000 coins! Take note that the position on the Career Track is saved for about 48 hours from your last spin. Champion of the Track has 5 reels where you may bet on 30 pay lines. The minimum bet is 0.01 and the maximum bet is 0.50 per line. If you want to play this slot game automatically for a number of spins, you can simply use the Autoplay function that can be found on the lower left corner of the screen. You can click on the number of spins that you like (from 10 to 1000), click Start and the game will spin automatically for you. In case you would like a slightly complex setup, click on the Advanced Settings button and Stop Autoplay: on any win, if Free Spins is won, if Bonus Game is won, if a single win exceeds a specified amount, or if the cash you have increases or decreases by a specified amount. When you’re satisfied with your advanced Autoplay settings, click Start and the game will spin for you automatically.